Radio420™: Alla Xul Elu Unleashes First “Church of Xul” single “We Are One”; Lineup Revealed For Church of Xul Release Party! We are exactly only 11 days away until Ohio’s Alla Xul Elu highly anticipated record “Church of Xul” officially drops via MNE Friday, April 26th! What’s super fresh is the fact the mighty AXE just unleashed their first single for “Church of Xul”, the haunting-soon to-be grave yard smash, “We Are One”. Yes! “We Are One” is available now for your listening pleasure via your preferred digital music streaming platforms! Stream the blasphemy until you wake the dead! 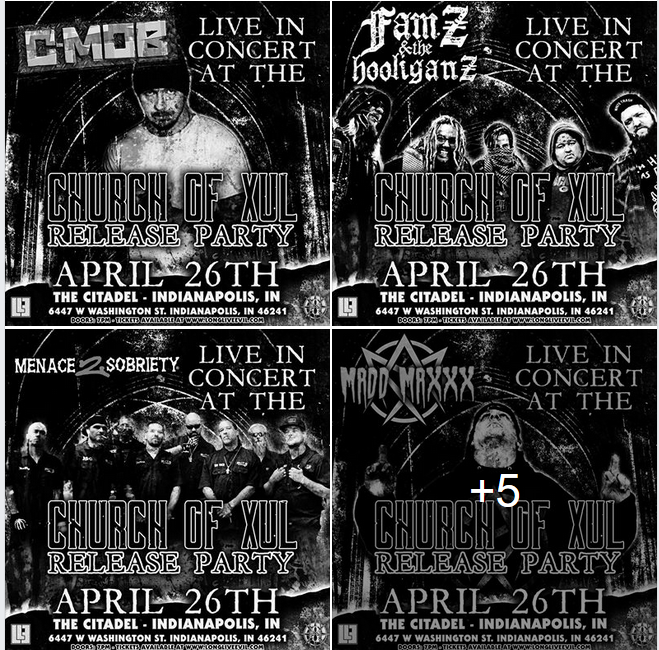 Indianapolis, Indiana get ready for pure underground mayhem occurring Friday, April 26th at the Citadel. The official lineup for Alla Xul Elu’s “Church of Xul” release party has fully been revealed! C-Mob, Madd Maxxx, Menace 2 Sobriety, Super Famous Fun Time Guys, SevidemiC, Famz & the Hooliganz, SickNSane, and Soldiers of Fortune will be slaughtering the “Church of Xul” Release Party alongside Alla Xul Elu! The flames of hell are bound to consume the Earth during this extravagant event!